The Canary Islands may be part of Spain, but the cuisine you’ll find in this archipelago of stunning islands has its own distinct flavour. You will, of course, find all of your Spanish favourites such as paella, tapas, cured meats and sangria, but there are many more tasty treats you need to try in the top Tenerife restaurants. Tenerife is one of the Canaries’ most popular destinations and the largest of its islands, which means there are a number of dishes that are specific to this location. While I was in Tenerife I ate as much as I could (that’s the kind of research I love) to find the best dishes, as well as the best places to eat them. From restaurants with incredible, panoramic views, to hole-in-the-wall cafes serving mouth-watering seafood, here’s how to have a truly delicious holiday in Tenerife. Tenerife boasts a number of specialty dishes that you definitely won’t want to leave without sampling. Most of these can be found at restaurants dotted around the island, so you won’t need to hunt far and wide to find them. Which is just as well, because once you’ve tried them once, you’ll be craving these specialties for the rest of your holiday! A Canarian specialty that's difficult to describe but all-too-easy to devour, papas arrugadas are essentially steamed potatoes - with a delicious sauce! Cooked until the skin becomes wrinkly but the inside remains soft and deliciously fluffy, these small potatoes are served whole with salt seasoning and mojo, a salsa-like dip made either with red peppers and chilli or green peppers and herbs (both equally tasty). I know it doesn’t sound like much, but trust me when I tell you these potatoes are life-changing. 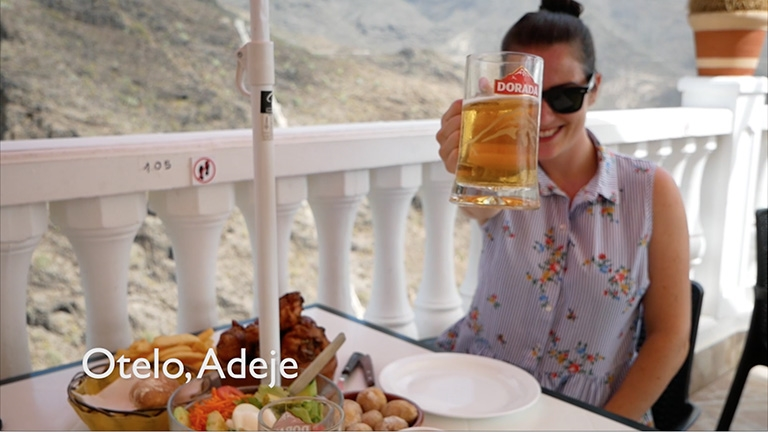 Not a dish, but still a must-try when in Tenerife, Dorada is the Canary Islands’ very own cerveza, or beer. It’s light and refreshing, and perfect for lunch in the sun after a hard morning of serious relaxation. Smothered in salt and fried until they’re blistered, these snackable peppers are among the most addictive tapas dishes in the Canary Islands. Padron peppers aren’t spicy (well, mostly - apparently one in twenty packs a punch), they’re just little Spanish bites of heaven. Sitting somewhere between a feta and a halloumi (my two favourite cheeses), this Canarian cheese is served in a grilled slab, along with the traditional mojo sauce that’s also paired with papas arrugadas. It’s great as a starter, and is best enjoyed with a crisp glass of white wine. Speaking of wine, did you know that the Canary Islands produce their own? It’s hard to believe when you see the arid landscapes and extreme climate, but Tenerife’s white wines are crisp and dry, and complement many of the island’s salty dishes, like fish or cheese. If you’re a fish lover, you’ll be in your element in Tenerife, as fresh seafood features on almost every menu on the island. Some of the fish the destination is known for are vieja (parrot fish) and cherne (wreckfish, or grouper), but ordering a restaurant’s fish of the day is the best way to guarantee the freshest, most delicious meal on the menu. If you want a really memorable seafood treat, check out El Cine, which I’ve written about in more detail below. Chicken fans are in for a treat with the local speciality Pollo al ajillo, which is deep-fried, garlic-infused chicken. It’s a simple, yet oh-so-delicious you’ll be craving for days after you’ve eaten it. The best place to try this specialty is Otelo in Adeje Town, which you can read more about below. Definitely not unique to Tenerife, but essential for any sun-drenched getaway. Because, after all, if you didn’t eat an ice cream, did you even have a summer holiday? Although many restaurants around the island serve the typical dishes I’ve listed above, there are a couple of places that are worth checking out. Both of these recommendations offer something of an experience, rather than just a meal, and they’re both worth going out of your way to find! Tucked away in the back streets of the popular seaside town of Los Cristianos is the unassuming El Cine Bar, which, by all accounts, is one of the best places to eat on the whole island. And it’s easy to see why. The bar is almost on the beach, but hidden just behind a row of shops and other restaurants. There’s nothing fancy about it: the chairs and tables are plastic, there’s no air conditioning and the menu is limited - but the seafood is fresh and tasty, exactly how you expect it to be when you’re surrounded by so much ocean! I tried the whole octopus, which was fried until the tips of its tentacles were crispy, then served with loads of juicy lemon. It was packed with flavour, and the same can be said of the prawns, which were sprinkled generously with salt and tasted incredible. And the best part? The price. Main dishes at El Cine vary between €7.50 and €9, meaning you could eat there every day - and it’s very tempting to do so - without feeling like you’re being too extravagant. You can’t make reservations here, but it’s worth risking a wait. Although El Cine is open until 11pm, lunch is the best meal to enjoy here, when the sun’s shining and you can go straight from the restaurant back to the sweeping, sandy beach that’s just steps away. Don’t be put off by the off-the-beaten-track location of this restaurant - trust me when I say it’s well worth the drive. On an incredibly steep backstreet in Adeje Town is Otelo, a restaurant that hits the rare combination of serving unbelievable food as well as boasting a breath-taking setting. Forget about the indoor dining room and head straight for the wide terrace, which offers views over Barranco Del Infierno, a ravine between mountains that loom so large it feels like you could reach out and touch them. It’s honestly one of the most incredible restaurant views I’ve ever seen - it’s hard to take it all in because the majestic mountains are everywhere you look. But the view isn’t all - the specialty of this restaurant is pollo al ajillo: deep fried, garlic infused chicken. It’s a no-frills affair, and you’re going to get your hands dirty, but with this mouth-wateringly good dish costing just €5, it’s no surprise that it’s not a silver service establishment. Fancy it is not, but it’ll definitely be one of the most memorable meals of your holiday in Tenerife. OK, this one isn’t exactly traditional Canarian cuisine but this delicious Italian restaurant shouldn’t be missed. The food is fantastic but it’s the location that really sets this restaurant apart. As you drive into the beautiful little town of Los Gigantes you’ll notice those huge and imposing cliffs, Ancatilados de Los Gigantes, that curve around the town like a protective arm. It’s a dramatic scene so make sure you stop at the photo point on the curving road into town to take a quick picture! You’ll find Restaurant Mamma Lucia next to the harbour where you’ll be able to sit outside with views over the bobbing boats and the giant rock formations. I recommend beginning with some small tapas dishes to share followed by a stone baked pizza. 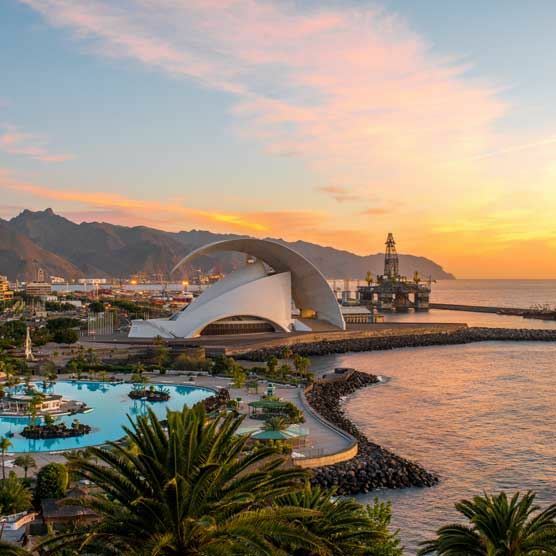 If you're hungry for more, take a look at our guide on the top things to do in Tenerife, or find the perfect resort for all-round fun with the family.